"... I consider it a massacre"
On the night of April 30th, the British marched out of Philadelphia with 850 men on foot and horse. Their destination was The Billet, present- day Hatboro. Their mission was to stop the Militia from disrupting supplies reaching Philadelphia. Their other objective was to capture the leader of the Militia General John Lacey. Three hundred militiamen were encamped with Lacey at the Billet; most of them were unarmed and untrained. The British marched through the Fox Chase area of Philadelphia down the Huntington Pike where they split. The Queens Rangers, a loyalist regiment continued down the Second Street Pike and the 500 British regulars went left toward Old York Road. The plan was to have the British regulars wait in ambush along the Horsham Meeting Road near the Old Mill Inn in Hatboro. The Queens Rangers were to drive the Militia into the waiting British troops. 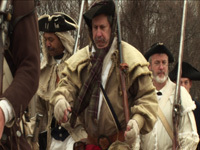 The Militia were expected to retreat along the Horsham Meeting Road which leads to Valley Forge and the Continental Army. General Lacey was a native of Bucks County, Pennsylvania and was the youngest appointed General under Washington's command. During the battle he saved hundreds of lives by keeping his militiamen together and heading his troops north escaping into Bucks County. The Militia suffered 9 men wounded, 26 killed and 58 captured. The British reported no casualties. However, several were wounded and 3 horses killed. The British never achieved their objectives. They did not prevent the Militia from continuing to disrupt supplies and most importantly, General Lacey was never captured. While it is true the British could claim this a military victory, it was however a British failure thanks to the quick thinking and leadership of General John Lacey. He is truly a faceless hero of the American Revolution.